The Rhinowares compact hand coffee grinder includes an adaptor so you can grind straight into an AeroPress. This grinder is a great solution for grinding coffee “on the go” – for travel, work or even just at home. 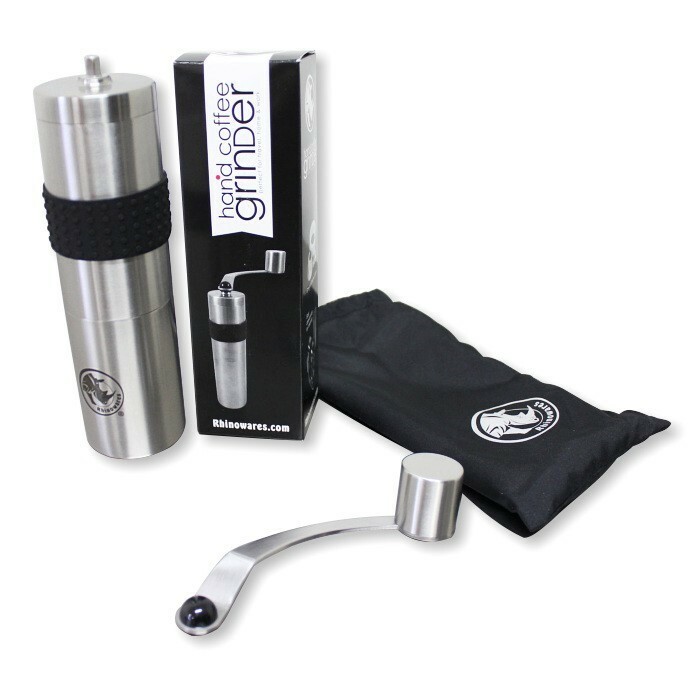 Being an easy hand held stainless make grinder with a sturdy grip. A smaller more compact grinder that would fit in an Aeropress. The compact grinder answers numerous requests the Rhinoware Grinder took it one step further and included an adaptor that fits to the body of an Aeropress. This adaptor made the process of producing a brew less cumbersome and it’s always good to have something fit for purpose. Overall the Rhinowares compact grinder works great is of stainless steel in comparison to plastic grinders which break a lot easier and does the job required meaning we got a fine grind of coffee and easy hand held use. The Rhinowares Compact Coffee Grinder is available to purchase through The Coffee Warehouse for $70 plus postage. If you would like to order a Rhinowares Grinder, please contact Andrew on 0412 203 921 or email him at andrew@nullcoffeewarehouse.com.au for a quote including postage within Australia.